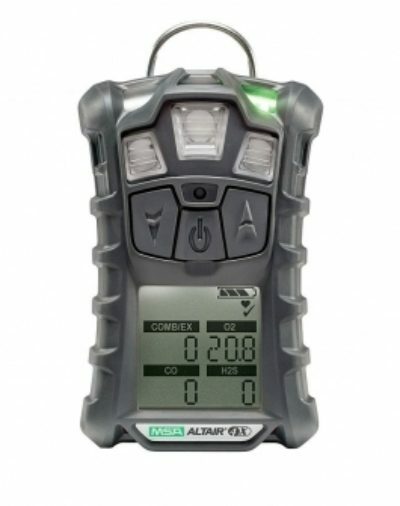 The MSA ALTAIR 4X is a reliable multi-gas detector that measures O2, H2S, CO and combustible gas. The tough housing provides unsurpassed durability, including the ability to survive a 6 m drop test onto concrete. The Altair 4X is easy to operate with its large, glove-friendly buttons and a high-contrast display, in any work environment, even low-light conditions. The real strength of the ALTAIR 4X Multigas Detector comes from new sensor technology.MSA XCell Sensors double the industry average, and are engineered using MSA’s proprietary application-specific integrated circuit (ASIC) design. The sensors’ controlling electronics is miniaturized and placed inside the sensor itself. Available in charcoal and phosphorescent.